Whilst most of the science blogosphere my science blogging colleagues were getting stuck in to Science Online London 2012, I was at the closing plenary of the 62nd meeting of the American Society of Human Genetics. If solo12 is the home of science online in London, ASHG2012 was an example of science online in action: the use of social media to share and discuss cutting-edge genetics research. The ASHG 2012 app contains the conference program and schedule, together with abstracts of all posters and talks. Chris Gunter, @girlscientist, is a member of the ASHG 2012 Program Committee and chair of the ASHG Communications Committee. It is thanks to her drive that the infrastructure was in place for social media to be used to enhance the experience of the conference, both for attendees and for those who could not make it in person. The conference program detailed social media guidelines. 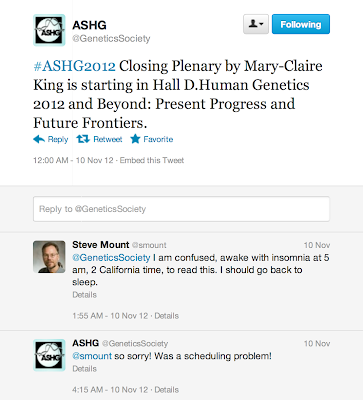 Presentations were tweetable and shareable unless the speaker requested otherwise, and the conference hashtag, #ASHG2012, was a source of summaries of talks as they were delivered. Early in the conference, Daniel MacArthur, @dgmacarthur, tweeted his ten guidelines for tweeting at conferences. A social media workshop formed part of the program. The conference app contains the schedule together with poster and presentation abstracts and space for taking notes. This was useful for planning and navigating a busy week. The Society twitter feed, @GeneticsSociety, kept attendees updated with program highlights and any changes, although it was not flawless and confused jetlagged geneticists further by tweeting to kick off the closing plenary in the wee small hours of the morning, in error. Lesson: when scheduling tweets, use the twenty-four hour clock. Mishaps aside, social media was a definite presence at this meeting, from the tweetup on the first night to the crowdsourced questions to the panel at the closing plenary. I hope that social medial continues to be integrated into future meetings, both at ASHG and beyond. The ASHG meeting is vast. This 62nd meeting was bigger by a factor of fifteen than the largest meeting I had attended previously. Registrants topped out at nearly seven thousand, a small town’s worth of geneticists and several hundred companies represented. As is often then way with conferences the highlights for me were the people I met. The quality of the talks was high, and the organisation of the conference was slick. I attended a variety of sessions. The Moscone Conference Centre catered to delegates’ every need. Wet mini umbrella bags appeared in the lobby as soon as it started to rain. If we use genomic information correctly, we will simultaneously describe our similarities and differences without reaffirming old prejudices. More importantly, the careful unbiased study and interpretation of the human story coded in our DNA will enable us to appreciate the fact that individuals cannot be treated as a representative for all those who physically resemble them or who share some of their ancestry. The human genome is a mosaic of our experiences, past and present. 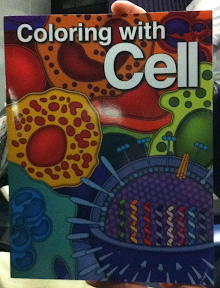 Yes, it is a Cell Colouring Book in the tradition of the anatomy colouring book aimed at medical students. With thanks to Cell Press for quality swag. The session continued with a focus on clinical applications. Genetic mutations, often in drug-metabolising genes, can result in large variation in how patients react to a drug. A drug that is otherwise beneficial could cause severe side-effects, or even death, in patients carrying those mutations. Being able to identify the relevant variants means that dosage could be adjusted, or an alternative treatment found, for affected individuals. Examples were presented from a clinical trial where this principal was used to demonstrate that genotyping patients and giving tailored treatment advice reduced side effects in mutant individuals. Ability to identify variation is no longer the limiting step in our field. This entry was posted in PhD and tagged ASHG2012, Conference, Impressions, San Francisco. Bookmark the permalink. Thanks for the nice summary, Erika. And yes, ASHG is huge now… your chalkboard photo shows 6,892 (and counting). When I went to the combined ASHG / International Congress of Human Genetics in Washington in 1991(? ), the total registration was about 5,000 as I recall. I did try to follow last year’s ASHG in Montreal using the Twitter hashtag, but found it completely useless – when you get so many people together tweeting at once, everything just scrolls off the screen too fast! Or worse, it locks up your Twitter app (Tweetdeck in my case). I love the disinformation in that concluding remark… “Ability to identify variation is no longer the limiting step in our field.” I invite whoever said that to just try and generate a few thousand genome sequences for a case-control study, and see if that proves rate-limiting or not. And then try and detect all the SNPs/SNVs (easy), small indels (also easy) and the ~400,000 or so larger copy number variants in each genome (not so easy, but works, if you accept that current methods will only find half of them). Don’t get me wrong, I love whole-genome sequencing as a concept, but as the be-all and end-all of genomic analysis, it’s a bit like GWAS microarrays were ten years ago – not quite there yet. You were not the only one with that comment about the hashtag. I think room- or session-specific hashtags (à la Science Online) would help with that. I don’t think anyone said that WGS was the be-all and end-all! From the sessions I went to, I came away with the impression that lack of data is not the bottle-neck, not for the time being, anyway. Epigenetics Schmepigenetics – don’t you know it’s all about the epitranscriptome now? !